have you ever had to triangulate with map and compass? I've recently been practicing some map and compass fundamentals. I'm in the camp that thinks it's generally much easier to "stay found" than figure out where you are. But I'm curious if any of you have actually had to use triangulation techniques to determine your location? If so, what was the scenario that led to it? I know we have many folks around here with SAR experience; my guess is those folks work hard to stay found but it's an interesting topic to me. - Knowing where you are has levels...I often don't care as much exactly where I am but know generally where I am so therefore don't consider myself "lost". That includes keeping one eye on the topo map and "reading" the hills and valleys so you know rough location. Sometimes reverting to the compass when I lose count of which valley I passed and if it is the one I want to follow or the other one that trends in a different direction, etc. A constant reading of the landscape (even when you only get glimpses of peaks through trees you can watch valleys, slope aspect and steepness to keep track) leads to an awareness of location that results in not having to revert to classic triangulation. - Don't know how to answer if I "had" to use triangulation for backpacking (never done SAR and have never been "really" lost). Definitely have used it in off-trail backpacking to figure out a certain problem (i.e. is that the peak I am heading for or is it the next one?). - I "had" to use map and compass triangulation constantly in the 90's for work, before the advent of affordable GPS units with enough accuracy. Used to wander around sites hundreds and sometimes thousands of acres flagging streams and wetlands among other work. Needed to know where the property stopped roughly at minimum and keep up with relatively accurate sketches so surveyors could come in later and locate things precisely. Also had to locate monitoring points planned and permitted at certain locations so distance and bearing over a long distance was critical. Even today, I prefer to use map and compass over my Inreach to figure out where I am. It's just an enjoyable pastime in areas where its not critical to keep from getting lost. There are lazy weekends where I rely on technology more, but I get the most satisfaction out of the classic navigation. Ski touring a trail that threads through very dense aspen stands. As the trail exits the aspen you want to note the specific location of this exit, so you can find it on your way back out; otherwise waste a great deal of time resorting to alternative routes. Traveling XC you need to determine ahead of time a ridgeline objective that will send you down the desired basin on the other side. You have three similar looking cols that are not distinct enough to identify on a topo map from each other. Pick the wrong col and you descend into a hanging valley that block access to the day's objective: a valley far below. You need to determine your precise location, so you can determine the heading that leads to a point that is obscured by clouds or forest. One can also orient with just one reference point if you have a topo map and altimeter. You specific location lies along the compass vector where the corresponding elevation contour crosses that vector. This method isn't always reliable; sometimes the terrain is too flat or the compass vector cross several contour lines of the same elevation. In such case one can resort to an even more tedious orienting technique. They don't teach this in orienting courses, but you can use a single vector reading to perform triangulation if you also have an altimeter, a protractor, and the means to resolve trigonometry functions (calculator or slide rule). This comes in handy when other orienting techniques are unavailable or suspect. Once you have the compass bearing of a distant reference object, use the protractor to estimate the angular slope between you and the reference objective, or use the altimeter to determine your altitude, and the map to determine the elevation difference between you and the reference objective. Use a map scale to obtain the distance to the reference object. Plug these data into the function of your choice. One can use these tools to cross check conclusions by resolving one's location using two or more different trigonometry functions. When I trekked XC in Zion NP I used triangulation to navigate, because the terrain was often difficult to distinguish and could end up in the wrong slot canyon if I wasn't careful. I used triangulation only a couple of times to reorient. harder than it sounds; best not to get disoriented. I prefer to use a Topograghic map and an altimeter. The real problem was trying to find the actual peaks to measure from. Most of my outdoor experience has been in fairly rugged terrain. There a good topo map is all you need; I have on two occasions obtained a compass heading during poor visibility. That is over a sixty year span of fairly frequent outdoor activity involving a lot of SAR. Usually you are ascending a ridge crest or descending a canyon. In red rock canyon country, it is important to count the twists and turns because you cannot see landmarks and prominent points outside the canyon. Working as an archaeologist, it is important to locate archaeological sites with reasonable precision; in practice, nothing short of a theodolite will give acceptable accuracy (you can find the site again). until GPS arrived, some projects used radio frequency triangulation to determine site locations. In really critical situations, nothing beats a clear, recent, large scale aerial photo, but that isn't always available. Thank heaven for GPS! Even that isn't perfect - keep your eyes open and check often. Never been forced to use the compass. Chosen to use it at times when hiking an unfamiliar trail to gauge progress by reversing the vector from a known peak to see where it intersected the trail on my map. I learned to navigate that way in the military. We still used that method even after GPS technology was available because there was always the possibility of the batteries dying on an extended operation. Sure. Years ago we used to make topographic maps of timber sales with a surveyor's chain and a staff compass. I too learned to navigate that way in the military. I don't really have any specific scenarios, but it's a skill I practice on a somewhat frequent basis. It is definitely a good skill to have in the tool box. I learned to find where I was in Boy Scouts and got my map and compass merit badge in 1968 in Scout Camp in California. I still have the compass I was given for completing the course. My oldest camp souvenir. Its been a little over a decade when I used to backpack the Grand Canyon every winter and off trail hiked and triangulated where I am on a map, but I am sure I could still do it. I usually use the sun.moon and my watch to tell direction when I want to know. Absolutely. Kaerned navigation as a part of sailing on San Francisco Bay. And when we are off-trail is is a part of our routine. It helps to know roughly where you are if you want to stay found. These are perfect examples of how to use triangulation while hiking. In canyon country marking entrances and exits are indeed essential. But in order to make triangulation work, one should start out immediately triangulating and using the compass, not after you are lost. Triangulate your car or camp and those other important points as advised above for those reasons. Two scales of maps seem to work best, one, the most detailed of the area you are actually walking in and second, a less detailed but sweeping scale for far peaks and landmarks distant. Thanks everyone, great stuff here and exactly what I was looking for. I've gotten really good at dead-reckoning when on trail, knowing my average speeds and calculating distance by looking at the time (surprisingly accurate with that) and as others have mentioned, I've spent countless hours pouring over topographic maps and attempting to associate terrain with them in the field. I've also used an altimeter to great affect, ruling out false summits and such. I hope to do some more serious off-trail navigation this year in the Wind River Range so that's a primary motivator for me to get really good at this. That’s right, true backcountry navigation includes all of the skills you mention. The major times I find compass triangulation necessary is off trail travel in the back of the beyond in rough canyon country. Then it can keep us from getting lost and save a lot of time. It can take 20 minutes or more at times to find an entrance and or exit to even a short width canyon so marking those points can save much time and keep us from becoming disoriented at times in the hall of mirrors terrain. It also lets us walk directly to the specific bay off a Mesa where our camp is located below. If the light is failing the technique can be a real savior in cutting off needed time before darkness makes travel too dangerous. Just take a writing instrument and some paper or small notebook to put down the data you will need later. Even with GPS technology for work I still carry a good compass. I usually carry a cheaper but quality one for backpacking but if I am serious about needing it for accurate readings I carry the work one. A solidly built compass with a mirror so you can site a landmark and see your compass readings at the same time is invaluable. A degree or two difference over a long distance can result in being off by hundreds of feet. I don't know how to triangulate, but wish I did. My compass/map skills are fairly basic though I rarely get lost. I backpacked once with a guy who has fascinating map and compass skills and we did a bunch of bushwhacking. We navigated through thick forest, detoured around a swamp, and nailed the take out point within an incredibly small margin of error. Over a decade later I am still in awe of how well he can navigate in the bush. None of the skills needed are particularly hard, you just have to make time to practice over and over until it is second nature. Time is the hard part to find. I learned it in the army, too. Part of my job involved crewing a tracked vehicle with a primitive position determining system, consisting of an encoder in each final drive that counted the number of turns each track made and a gyroscopic azimuth determining system. Starting from a surveyed known point you were generally good for 6-8km, when you’d have to update the PDS and realign the gyro at another surveyed point. If where the PDS was told it was was within a certain tolerance of where it thought it was you were good to go on, otherwise you’d have to calibrate the PDS. Given those limitations we were trained not to depend on the PDS for knowing our location, and the gunner (me, at times) had to keep track of our location on a map in case we needed to shoot a hasty fire mission at some point on a convoy and no survey was available (being an area weapon, map-spotting our position within 100m was adequate.) If the PDS and your own estimate of your position were in rough agreement you used the PDS coords, if not use your own and hope they’re not too far apart. So we received a LOT of map & compass instruction in training, including triangulation using 2 points identifiable on a map or one point and a linear terrain feature you were on (road, river, etc.) It was one of our most common training subjects once we got to our permanent units, because you can’t be TOO good at it. Even when we started being issued GPS receivers of our own so we weren’t dependent on survey points, we still used the map to check the accuracy of the GPS (this was the early-mid 90s.) We were also trained to memorize routes, using easily identifiable checkpoints and mental time-speed calculations to keep track of where we were. Given that in a heavily wooded area seeing 2 easily identifiable landmarks generally meant climbing to the top of a pretty tall hill, and that we were almost always on very strict timetables, meant that staying found was by far the more preferable method of navigating. Even now I still memorize my general route (or one leg of it) ahead of time and use checkpoints to track progress. When I do use a compass it’s almost always the rudimentary one that’s part of a whistle/thermometer/magnifier/compass thingie I have, and then mostly at night when enough stars to determine direction might not be visible through the trees. Even in the tallest White Mountains you spend a lot more time below the treeline so a compass is more useful than the stars for roughly determining direction. You still want to know which constellations are visible and where they are in relation to a possibly obscured Polaris or moon at any given time, though! If you want to really develop your skills , you might want to contact your local orienteering club. For the US, the national organization is Orienteering USA. https://orienteeringusa.org/ These clubs are found all over the world. The maps are very high quality (much better than USGS maps), and the clubs offer training from the raw beginner level to expert levels where the competitors are running full tilt through the woods. There are a series of difficulty, ranging from "White" courses (you stay on trails), then gradually get more challenging as you develop your skills up through Green, Brown, Red, Blue...... In the more advanced courses, you will encounter rugged terrain and bushwhacking. Patrick...I honestly thought about you and this thread the other week navigating the upper plateau of boggy highlands in this photo...and many more like it. 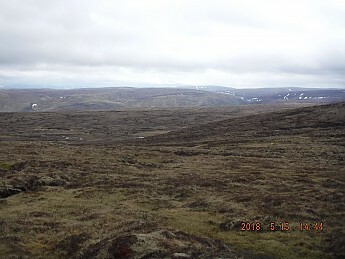 You would love this terrain...have to keep your navigation goal on one of the low hills in the long distance, do some advanced planning on intermediate goals to avoid deep peaty bog channels that are difficult to see and cross without going in waist deep, and at the same time concentrate on the short term of every step to avoid going in. Absolutely the most fun I have ever had off trail although slow going. Navigation skills were a must without prominent peaks to keep a casual eye on. Thanks to all for the additional info, much appreciated! ah very neat Phil, so I assume the bogs were accurately marked on your topo's? Bogs were on the tops, slopes, and glens. It's difficult to describe how wet the landscape is....the Ordinance Survey maps (their version of USGS) were pretty good but the wet ground cannot be easily depicted....its everywhere! And this was a dry time for Scotland. I'll give a better picture in the trip report once I catch up a bit round here. Topic: have you ever had to triangulate with map and compass?